Fast Food? Sounds like something Sonic already! With how popular Sonic was at different times, it's not surprising he had several Fast Food tie-ins. 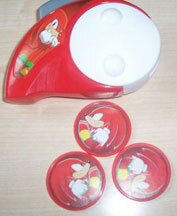 Places like McDonalds which appears internationally, featured Sonic toys for free in their kids meals. These had various degrees of quality and collectability. The early ones were just mini action toys that shook, rolled or flew. Later on, it switched to mini LCD games, and disk-launchers which were actually pretty neat. However, since the items were freebie give-aways, they were thrown out a lot, and also not too memorable from exactly which restauraunt they came...The best way to grab these is to go onto Ebay as SOON as a promotion appears in an eatery. This can be difficult if you are angling for European ones, and you don't actually live in Europe. The best bet is to either get a pen pal, or check ebay occaisionally to see what's popping up. If it's mini-toys you don't recognize, chances are some other restaurant has done a promo. Try to buy all of them on one lot. These do not last well, and you'll pay more later on if you don't. UK Burger king did a series of toys which were similar (but not quite) the same as some released in the US. McDonalds' also did a series. This is from Burger King, to celebrate the release of Sonic R on PC. A close up of that thing in the background. It vibrates. But what is it? 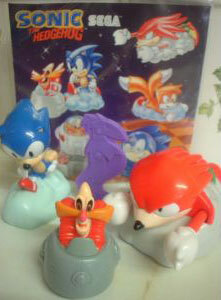 The little ovals inside have one Sonic and one Robotnik on them. But what is the goal? This isn't even a maze! Apparantly, there is no actual goal. A Kids Meal Burger King assortment. (With back card) If you wind up the Knuckles, he punches his fists. The Sonic and Robo have magnets in them, so when you push the Sonic along, the Robotnick moves away. But what is that purple thing in the background? It's not a cluckoid. It looks like some kind of Proto-Scratch. (From AOSTH, remember?) No one is ever selling 'proto-scratch'. It is actually a target for the Knuckles wind up to knock down. The Tails is a 'pull back n' go' toy, and he came with a "grounder" like target which you don't see here. The larger Eggman one (from the top photo) can be filled with water and pressing the control pad shoots air through the water. This is from England Burger King. Info/Explanations by Ota. Here is a large poster from a German McDonalds. It says "Daumen Drauf!" which means..."thumb on". Why? It is a German local-ism, a common alliterative word for mini-games that makes sense in its context. Credit to Link for translating it. This is part of an in-store display. Once a store is done with the promotion, some times these are sold, or given away to a lucky fan. Items such as this are a rare part of any collection. 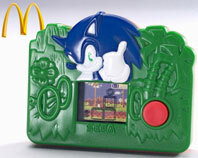 Here's an official photo for this run of LCD McDonalds Sonic games. 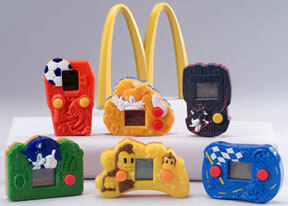 (photo by McDonalds) These were relased in 2003, in the USA...but also in other countries. Where? Each game is a relief with 2 color of plastic and 2 colors of paint. The official descriptions are in quotes. Official photos and quotes found by CornBoy-Thank you! This game doesn't belong! But it was part of the promotion. Super Monkey Ball is a Sonic Team game, so AiAi and some other monky appear on this banana shaped game. "AiAi Banana Catch -- Bananas are falling from the sky and AiAi needs help moving back and forth to collect as many bananas as possible." "Sonic The Hedgehog Speedway -- Gamers are challenged to move Sonic The Hedgehog back and forth around the racetrack without running into anything." Here is a racing game of some sort. Too bad the case is so dark blue, you can't tell what the reliefs are. Gameplay Explanation: "You move left and right avoiding 30 rows of cars per each of 3 levels. Speed (and therefore difficulty) increase each level. Crash 5 times and you lose. Also the top right corner is not Tails, it is apparently a city you're racing to." Do you want to play this game? You can play an online version if you click this link: Sonic Speedway Game. It is done in flash, and will play in the browser with your arrow keys. Do you have any of these other games? If so, and you can explain what to do (like in the above description) send it in for credit! "Sonic The Hedgehog Action Game -- Launch Sonic The Hedgehog up and down over platforms on an adventure to collect rings and make it safely through the obstacle course challenge." A Sonic game with palm tree and power ring relief. Notice that it only has one button. Also, the rendition of Sonic at the top seems kind of shifty. To play this game, you push the button and Sonic jumps over boxes and collects rings. He runs by himself, so all you need to do is jump. -Cornboy credited for gameplay info. "Shadow Grinder -- Help Shadow maneuver around cracks and jump over breaks as he skateboards down a tricky rail." Shadow's game looks like a city, and you're obviously supposed to grind rails with the single button to play. Shadow is constantly grinding down a diagonal rail, and you use the button to jump over gaps in it. This is one of the more easy to recognize games, as Shadow's image is clear, as long as the game is shown large enough. "Tails Sky Patrol -- Join Sonic The Hedgehog's friend, Tails, as he flies through the sky trying to collect rings." You can see the mountain background for this game, and even a bit of the word "Sega" from the bottom. Unfortunatly detail is lost because the photo has been over-brightened. Here is Knuckles' launcher. These are Sonic X based, as you can see from the traditional Sonic X stock art used on the stickers. They've done a good job to create 'spinning Knuckles' on their disk art, here. Curious disk launchers. This one is shaped like Sonic's head, and launches plastic disks with stickers on them, somehow. This is from a McDonalds of England promotion. 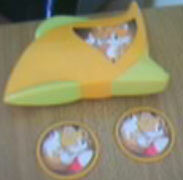 Tails' disks are rather cute, with well-modified art showing him curled up in a spin. These seem well thought out, using the head shape of the character to inspire the launching design, and putting curled up images on the actual disks. However, it seems they weren't very popular and got thrown out a lot, due to not having any obvious use. The disks rolled, but didn't launch and there are no targets. These may have been the inspiration for the disk launchers you can actually buy. These were a England AND Australia only release. Thanks to BrokenJaw for the info. Center photo by Flare. Even Shadow got a launcher, and this one is from a McDonalds' of England promo. 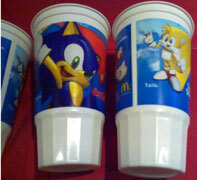 As you can see, Sonic, Tails & Knuckles were featured on paper (midsize) or plastic (large) cups. 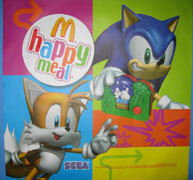 Here's a nice Happy Meal poster from England. It's bright and colorful, and they've adapted a CG image of Sonic into holding one of the LCD games given away on the promotion. Tails gets a nice big spot too. This poster is fairly large. (as it was used in the stores) Photo credit to Rhia. 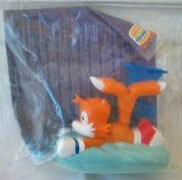 Here's a close up of the Burger King Tails toy from the photo at the top. You can see how he slides along on his 'cloud' so that it will sort of look like he's flying. His tails spin as the cloud rolls along. This was likely released in the USA as well.